Replay of Facebook Discussion; Is Broadband a Right? Yesterday, a heated discussion broke out on my Facebook page in reference to the broadband story that I posted, with comments from New York Software Industry Association president Bruce Bernstein. The conversation turned on the question of whether or not broadband could be considered a “right” or a “social good” or “public good.” This is a key question as the Obama Admin. considers how much money to spend on promoting affordable high-speed Internet access for all Americans. Check out the dialogue and chime in with your own two cents. Spencer, “disappoints everyone” is simply not accurate. As your article points out, rural broadband advocates seem to be happy with it. I guess the real question is … is broadband access a right or a privilege? Having come from a rural area, I know firsthand that not having high speed internet available (or available for an exhoribant fee) is a major inconvenience. Spencer, if I understand correctly, major broadband providers are balking at “leasing” discount access to rural providers. That’s a business decision, I’m aware; but speaking purely from the standpoint of social responsibility, I believe it’s the wrong one. How expensive is it for these companies to grant access to their network? Doesn’t seem like it would be THAT costly … but nicely done article! By the way, I scanned a discussion of this in the most recent issue of Business Week. Broadbad access is not a right. It comes at a cost that must be born by someone, either the customer, the business that provides it or tax payers. The biggest problem with bband access in rural areas is distance to the head end for cable providers because there is so little concentration the cost of service are not amortized over a wide enough pool to make it cost acceptable. DSL simply doesnt work as you move beyond a fixed distance from the central office. Business will not absorb the loss it will simply pass the cost on to all consumers. just because something “comes at a cost the must be born by someone” doesn’t mean it is not a right. for example, is police protection a right? many people (including myself) argue that health care is a right, or education. or what about postal service? I believe very much in free market principles; but access to the internet is rapidly becoming a (if not THE) key component in social mobility – if it’s not there already. Do private corporations have a social obligation in this sense? In today’s economy, where everyone is suffering, poor urban and rural citizens are doing so disproportionately. I think the government should take the lead in rewarding companies who undertake initiatives to improve the quality of rural life (tax forgiveness?) – with broadband being a central component in such a strategy. However, I also wish the federal government wouldn’t tax this service so much. That’s very unfortunate. is electricity a right? “someone” had to pay for the build-out. what about modern paved roads? no it not a right. you pay for it. it becomes a public good over time. a right is something you have and dont have to pay for. The government may decide to susidize it but that doesnt make it a right. for instance. we all have a right to free speech but the government or business is not obligated to pay for the broadcast of that speech. Nothing does more damage to long term economic growth than the constant expansion of “rights.” You have a right to live where ever you want, but that does not obligate the government to subsidize the exercise of that right. electrification in rural areas was heavily subsidized by the government. that was one of the great accomplishments of the New Deal. check out the history of the TVA. the taxpayer subsidized the rural citizens to give them electricity. the taxpayer subsidizes YOU to give you roads. the same can eb done with rural broadband. nothing does more damage to long term economic growth than market fundamentalism. I think you confuse public good with right. A right is something that cannot be denied by the state. A public good is something the state has decided to pay for because it benefits the common good. Roads are both public goods and private. health care is both public and private. The right to equal protection under the law is universal and cannot be denied to any citizen. Wow, guess everyone had their coffee this morning. Very interesting debate going on here. Here’s my two cents: I agree with Chris and Bruce that broadband access has become an essential service for today’s citizenry. However, I also agree with Laurence that to date that the cost of Internet service has been largely born by the private sector. Now, we as a nation seem to be entering a new phase of the Internet where the government is deciding that it has become a public good worthy of subsidizing, much like Eisenhower backing the government creation of the interstate highway system. So the key, it seems to me, is to structure the subsidies in a way that don’t alienate the existing private sector investments. After all, corporations are going to be the entities that actually build the new broadband lines–with government funding. So we need the participation of the private sector in order to reach universal broadband quickly and efficiently. One other interesting wrinkle: will the Obama Admin. also try to pursue another policy goal of injecting more competition into the broadband market through these subsidies? A lot of companies/folks are lobbying the government to do so, such as Google, Intel, etc. Bruce: my headline should have said: the bill disappoints nearly everyone (except the rural advocates, as you mentioned). One last question: Does anyone know why broadband got shafted in this bill? Given the high priority Obama placed on universal broadband and the existing estimates that it would take tens of billions, you’d think the House Dems would allocated more than $6 billion. Heck, the so-called smart grid technology got $32 billion, while other infrastructure projects (rails, water, roads) got close to $100 billion. I heard Larry Summers may have been behind this but I am not sure. I have a guess on this issue. But its only a guess. Smart grid is absolutely essential to move into a green friendly energy infrastructure. Rail, water and road spending is immediately noticeable by a large swath of the public and legislators can show up and cut ribbons. It also generates a lot more jobs immediately than either smart grid or bband. BBand is mainly an issue in rural areas without access to cable or too far from a co for dsl. Rural areas tend to be RED areas, they are not the winners these days. Again i am speculating. The idea of “economic rights” is not a new one. It is ironic that you are dismissing the idea on the MLK holiday. MLK’s last campaign, the “Poor People’s Campaign”, was built around an Economic Bill of Rights. Spencer, aren’t the rural advocates the most important people here, as they represent the CONSUMERS of the new broadband? Your article showed that the bill disappointed industry advocates and (possibly) Atkinson from ITIF. The only consumer advocates interviewed were happy with the bill. I personally am not making a judgment at this time. The industry people say tax credits would get the process going, and thus create economic stimulus, faster. This claim should be examined. One more point: Spencer, I am not convinced that private industry is the ONLY or in all cases the best way to get broadband to rural areas. Perhaps not for profits or public/private authorities would do a better job. Once again, the TVA is an example. Thanks very much for writing this article and bringing this issue to everyone’s attention. Spence, if the economy wasn’t in the tank and a $850 billion stimulus bill up for approval, would Congress allocated more or less than $6 billion? Sounds like a good chunk of change to me, and better than nothing. Just because MLK had an idea doesn’t mean it is correct. To me, rights are things which we possess as human beings which the state cannot deny us. Rights are expressly articulated in the constitution. Entitlements are things the state determines we have a right to recieve or obliations to pay. Univeral health care is an entitlement not a right. So would broadband or electric utility. It is a core of my belief that if we have a” right” to everything we will have nothing. Too many people throw around the word “rights” to mean they think they deserve something they do not have and demand that someone give it to them. That doesn’t mean we can’t petition the government to provide a service, paid for by others, that we think benefits the whole. But the more we ask the government to do for us the more dependednt to that government we become. The more powerful the government becomes and the less free we become. I am willing to debate your philisophy but I don’t think Spencer’s page nor this thread is the proper place to do it. Tim, as Art Brodsky from Public Knowledge said to me, $6 billion is nothing to sneeze at. And it will probably do a lot of good. However, most folks would agree that universal broadband would require an investment of at least $12 to $20 billion (as I discuss in the story). Bruce: I agree that rural folks who have no access to Internet service should be at the front of the line. For both economic AND moral/societal reasons. As for the role of private industry, I also agree that there should be room for other players in the broadband industry, such as non-profits or hybrid groups. But my hunch is that big corporations will nevertheless play a central role–because they have the reach and resources to make a a big difference quickly. Interestingly, Qwest, which is very interested in providing bband to rural areas, was critical of the bill as well. Within this group, there was a growing awareness that New England’s universities and industrial research labs were a valuable asset distinguishing the region from the rest of the nation. The most impressive asset in the region was MIT. In 1930, Karl Compton, then the head of the physics department of Princeton University, accepted an invitation to become the president of MIT. Under Compton, MIT redefined the relationship between science and society. When Compton took office during the Great Depression, science was attacked as a source of social ills. Over the next twenty-four years, Compton worked tirelessly to strengthen basic scientific research at MIT and to promote the importance of science to a skeptical and hostile public. Compton advocated a broad education for scientists, one that responded to the needs of the time. In 1934, Compton proposed an ambitious program he called “Put Science to Work.” The campaign called for the public financing of “scientific and engineering research looking toward better public works for the future.” Instead of blaming labor-saving technology for society’s ills, Compton proposed the bold idea that science gave birth to great new industries. The egalitarian ethos of the New Deal stymied Compton’s campaign to finance research at elite universities like MIT. So Compton turned his attention to the regional level. In 1939, responding to a suggestion by Compton, the New England Council formed a committee to examine how new products might help reverse the terminal decline of the region’s textile and garment industries. Was this his new impossible mission? Thanks to Roosevelt’s bold and firm leadership, the United States was no longer in fear of dissolving into revolution or anarchy. But although unemployment declined and the economy advanced steadily throughout Roosevelt’s first two terms, the New Deal failed to completely pull the United States out of the depression. The median joblessness rate during the New Deal was 17.2 percent, and until the United States entered the war, it never fell below 14 percent. The country was still in the grip of fear, but it was of a different sort. It was a profound fear to take economic risks. The fact is, the crash of 1929 inflicted deep scars on the psyche of the nation—scars that would not heal until after the war. If Americans were afraid to deposit money in a bank, they were surely in no mood to invest in securities or any other venture that wasn’t as solid as Manhattan bedrock. Despite all the positives of the New Deal, and there were many, Depression-era tax policies had the unintended consequence of creating a “risk-less economy.” A string of tax hikes and new taxes extinguished the nation’s sparks of innovation. On top of the Revenue Act of 1932—one of the largest tax increases in American history, which doubled the estate tax, increased corporate taxes by almost 15 percent, and raised taxes on the highest incomes from 25 percent to 63 percent—the Revenue Act of 1935 raised new taxes on higher income levels, corporations, and estates. The Revenue Act of 1937 taxed short-term capital gains as ordinary income. And in 1936, Roosevelt added a higher top rate of 79 percent on individual income greater than $5 million—a rate that was increased again in 1939. By 1937, the undistributed profits surtax severely restricted the ability of small companies to build up their capital out of earnings, and the large surtax on individual incomes discouraged rich people from investing in new companies. The result was that more and more funds flowed into super-conservative investment trusts, and to insurance companies and pension funds. By the 1938 IBA convention, the financial community began to express deep concern about the nation’s atrophied capital markets. “If investors throughout the land, large and small, refrain from purchasing unseasoned securities of a young industry and refuse to take a business man’s risk, where will new industries obtain needed capital, and would not such a development slow down the economic progress of the country?” asked Dr. Marcus Nadler, a New York University finance professor. The brawl between Doriot and Curley was part of larger battle brewing between the democratic New Dealers and the republican business establishment. Most of the business community initially supported Roosevelt’s New Deal but after the government passed the Glass-Steagall Act of 1933, prohibiting commercial banks from owning brokerages, and then created the Securities and Exchange Commission in 1934, Roosevelt began to lose Wall Street. It didn’t hurt him politically, though. The country wanted drastic action and Roosevelt gave it to them in spades. Indeed, while most parties lose support in the first midterm elections, the Congressional elections of 1934 gave President Roosevelt large majorities in both houses, sparking a second wave of New Deal legislation. These measures included the Works Progress Administration, which set up a national relief agency that employed two million family heads; the National Labor Relations Act, which established the federal rights of workers to organize unions, to engage in collective bargaining, and to take part in strikes; and, most importantly, the Social Security Act, which created an economic safety net for the elderly, the poor, and the sick. Contrary to Doriot’s inane predictions, the New Deal helped revive the morale of the nation as well as the economy. After unemployment peaked in 1933 at 24.9 percent, it fell for three consecutive years until it bottomed out in 1937 at 14.3 percent. Although still a high level of unemployment, Roosevelt’s policies clearly brought significant relief to a nation desperate for the chance to earn an honest day’s work. Doriot also began to benefit personally during these years as dozens of companies sought his guidance. On October 25, 1934, the Kansas City Southern Railway Company hired Doriot to become a director, his first board-level position since his days with Willy Wiseman at New York Foreign and Development Corporation. In December, railway car maker Budd Manufacturing also hired Doriot as a director, and he soon after was elected to the company’s executive committee. In March of 1935, Doriot was made vice president of Budd Manufacturing, and in September, Budd subsidiary Budd Wheel offered him yet another director position. Lastly, in October, the Massachusetts Investors Trust, one of New England’s largest investment managers, hired him as a consultant. At the end of 1935, the head of Budd Manufacturing cabled Doriot, asking him to sail immediately for Europe. Budd had big plans for Europe and wanted Doriot’s help. But the offer came at a bad time. At Dean Donham’s request, Doriot had taken over the required first-year class in industrial management that year, although the Dean had asked him to teach it as a version of his Manufacturing class. With a staggering 450 students, it was the biggest class of his career, and Doriot knew Dean Donham would not release him for an extended period. Even though Doriot was unable to accept the offer from Budd Manufacturing, it didn’t stop him from agreeing to other outside assignments. In 1936, Doriot became a consultant to Ladenburg, Thalmann & Company, a New York–based investment bank. In 1937, Thornley & Jones, Incorporated elected Doriot to its board. Then in 1938 and early 1939, Doriot became director of more than ten other companies, including the utility, Standard Power & Light Corporation, and manufacturing concerns such as McKeesport Tin Plate. Dean Donham allowed faculty to perform outside consulting as long as it did not interfere with the main work of the School. It was his best way of keeping low-paid professors on staff. Doriot’s astonishing amount of outside work pushed the limits of the School’s rules. But Doriot was one of the most popular professors, and he was tenured to boot. Since Doriot was a workaholic with no family responsibilities to divert his energies, he managed for the most part to pull off the balancing act. 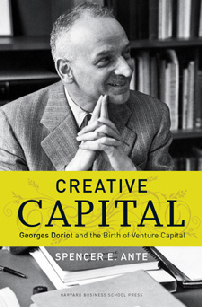 For the next forty years, Professor Doriot would use this course as his intellectual sandbox, training more than six thousand students in the arts of self-improvement and creative management. Eventually though, Doriot did make a few concessions. There were just too many balls to juggle. Between 1936 and 1938, he resigned from six, or about a quarter, of his outside positions, including those at N. W. Ayer & Son, Budd Manufacturing, Ladenburg, Thalmann, and Thornley & Jones. Doriot ended 1933 by firing another salvo—this time at his homeland. Like many immigrants, Doriot maintained a love-hate relationship with his home country. But Doriot’s feelings were more extreme than those of most immigrants. And now, for the first time, Doriot publicly expressed his disgust with France. Throughout the year, Doriot had been contributing a quarterly column for a French magazine called La Revue des Vivants, the Review of the Living Ones. In his December column, Doriot attacked the French government when it refused to pay a $20 million interest payment on her wartime debt to America. In the beginning of 1934, Edna met a gentleman who owned a very nice duplex apartment for rent on the top two floors of 101 Chestnut Street in Boston. Although Edna declined at first, explaining that it was too expensive, the gentleman clearly wanted them to take the apartment, lowering the rent so that it was more affordable. The Doriots soon moved in, and Edna picked up a few new items to furnish their new home. The couple liked the apartment but the new home did not brighten Georges’s spirits very much. For much of that year, Doriot was in a “rather disinterested mood,” as he described it. “I have been in Boston trying to act as a nice teacher not burdened with any new ideas,” Doriot confided in Strauss. “There has been no excitement up here, and I am looking for excitement.” However, as the mid-term elections of 1934 heated up later that year, Doriot’s life became entangled in an unusually public affair, giving him more excitement than he bargained for. These few sentences are probably the dumbest that Doriot ever uttered, and democratic politicians running for office picked up the remarks like they were a gift from the political gods. In a rare lapse of judgment, Doriot had crossed the line from iconoclastic to idiotic. In a speech in Boston on November 2 before a throng of supporters, James M. Curley, a three-term mayor of Boston who was running for governor of Massachusetts, used Doriot’s remarks on the New Deal to criticize Harvard University. Looking over his throng of supporters, Curley quoted Doriot’s comments on the New Deal and then launched his attack. Curley won the election, as did many other Democrats. And Doriot learned his lesson. Never again would he attack such a prominent political figure as FDR in such a public way. Instead of lashing out, Doriot would apply his influence and charm behind the scenes.